Brilliant! ...all the technique, the quality, the tone. Fantastic! What a lucky man you are." 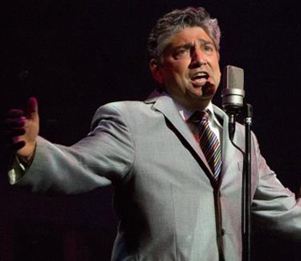 International Swing Singer Frankie Roma has been singing Sinatra and Rat Pack genre songs and entertaining audiences for over twenty years. As well as the songs of Frank Sinatra, Sammy Davis Jr and Dean Martin, Frankie performs the songs of UK's Matt Monro, Nat King Cole and Tony Bennett. Plus a few of the extremely popular Michael Bublï¿½. Frankie has just returned from making appearances in the UK's premier Rat Pack show in London's West End at the Hippodrome. This was formerly known as The Talk of The Town where both Frank Sinatra and Sammy Davis Jr. appeared in the Rat Pack heyday. "Just re watched our wedding video and smiled greatly when I saw your performance - totally brilliant. VERY impressed. You really are just great." Frankie also performs on long haul luxury cruise ships as well as locations across the US, the UK, Spain, Germany, Japan, the Caribbean and has had five sell-out concert trips to perform with full Swing orchestras in Southern Italy. Frankie is a powerful singer with a rich and tuneful, warm sound with phrasing as cool as Frank Sinatra's. Frankie is available to perform all over the United States and overseas at all kinds of events: Corporate, Public, Private Parties, Weddings, Birthdays, Christmas/Holidays, Openings, Launches etc. and is already taking bookings as far ahead as Christmas 2020.